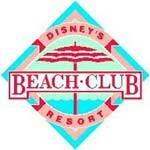 Disney's Beach Club Resort is a New England style Disney Deluxe Resort, shaded by broad oak trees and lapped by the gentle waters of 25 acre Crescent Lake. The lake is the site of lively family activity its surface dotted with rented watercraft and catch and release fishers. Stormalong Bay a water wonderland located within the Resort features waterfalls, a lazy circular river, a waterslide, an elevated tanning deck and Hurricane Hanna's Grill, a poolside counter-service restaurant and bar.